Today I’m sharing with you some local fish recipes that we still add to our palate. Since the recreation cod fishery is ongoing you might be able to enjoy some fresh fish if you come to our provincial paradise. Just a piece of insider information, for readers unaware, in Newfoundland & Labrador we say fish, we mean “cod” and if we talk about other fish species we name them specifically such as Salmon, Trout, Herring. Certainly, the cod fishery has been the mainstay of Rural Newfoundland & Labrador well before the days of Giovanni Caboto some 500+ years ago. Puddick – (defined in the Newfoundland Dictionary as Stomach). Wash cod cheeks. Beat egg. Coat cheeks in beaten egg. Put cheeks in a bag with a mixture of flour, pinch of salt and pepper. Shake until cheeks are well floured. 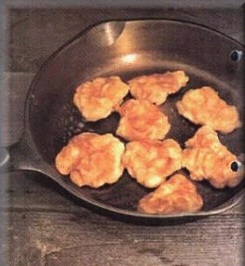 Fry in a pan until golden brown. A simple but delicious recipe! When the opportunity arises, drop by a get yourself some cod tongues. Cut salt pork into small pieces and fry until brown in frying pan. 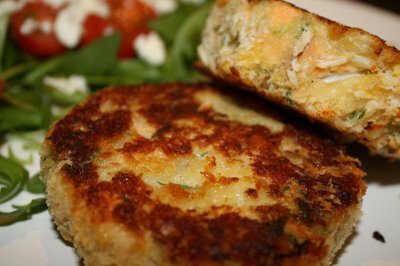 Remove pork cubes, leaving fat in pan to fry fish cakes. Mix fish, potatoes, onion and savoury together. Shape into round cakes and coat with flour. Add a dash of pepper. Fry both sides until golden brown. My grandfather would take great pride with drying fish and then placing it in brine. I’ve always enjoyed salt fish. This technique of drying and salting forms a lovingly delicious appetizer or meal that can be found in almost any local restaurant. If you are ever in the neighbourhood, drop by for a “scoff”. Choose a firm codfish. Remove head, tail and sound bone. Wash and clean skin with a sharp knife. Wipe dry. Mix dressing ingredients together and stuff the fish. Tie securely to a skewer. Place dressed fish in a roasting pan in which salt pork has been fried. Bake for 10 minutes at 450 degrees F. Reduce heat to 400 degrees F and bake for one hour. Baste occasionally and add sliced onion to roasting pan for flavour during final 20 minutes of baking. I will share with you other recipes from the Rural Newfoundland kitchen in the coming days.